Armed with broad legal authority and an off-the-charts level of drive and focus, Wight encouraged, cajoled, argued, and, if all else failed, outright bullied business and civic leaders into sweeping public heath reforms. 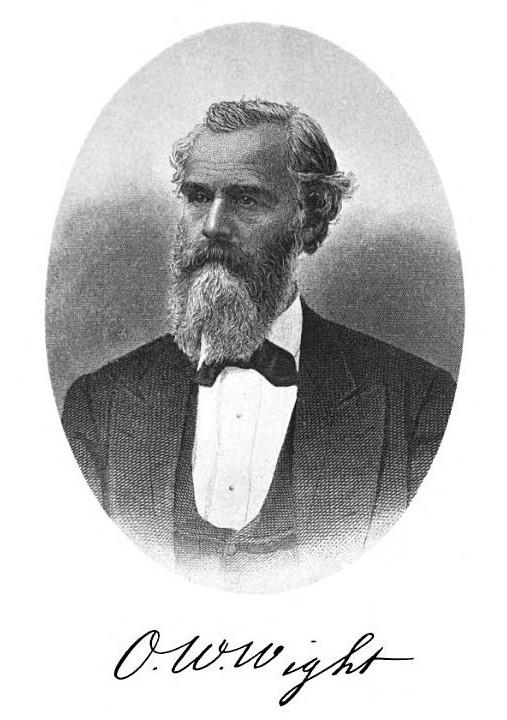 Wight was born in 1824 in Centreville, N.Y. As a child he would frequently complete a full day’s schoolwork in a half-day and reward himself by spending the remaining hours translating Greek classics for fun. By the age of 16 he was working as a schoolteacher. Moving to New York City, Wight taught religion, wrote numerous magazine articles, and gained a reputation as an eloquent public speaker. He also translated and published the works of noted European philosophers, which resulted in warm friendships with some of the world’s leading thinkers. After spending four years in Europe, Wight and his invalid wife (she suffered frequent epileptic seizures) returned to United States, where he published a 12-volume series of autobiographies of great men followed by a dozen more books of collected great works of literature and history. Then the Civil War broke out. Wight had been working with five publishing companies and four of them immediately went out of business. To secure additional income, Wight read everything he could get his hands on about medicine, then sat for formal examinations and was awarded a Doctor of Medicine degree in 1865. In a similar process he was admitted to the practice of law a few years later. His wife’s condition worsened with symptoms of insanity becoming more and more manifest. Wight hired a caregiver who soon came to be regarded as part of the family. In a plan proposed by Wight’s own wife in one of her increasingly rare lucid moments, Wight obtained a divorce, married the nurse, and both of them formally pledged to adopt and continue caring for the now-former spouse. This was a highly unconventional arrangement for the time, and it would be the cause of a great deal of nasty gossip in the ensuing years. In 1867, Wight moved to Oconomowoc and built a thriving medical practice. However his former wife’s condition reached a point where there was no choice but to place her in an asylum. Shortly after, Wight’s second wife died. Grief-stricken, he moved to his brother’s home in Brooklyn, N.Y. to recuperate. But his thoughts kept returning to Wisconsin and he contributed a series of articles to the Milwaukee Sentinel on political reform, which won a great deal of favorable attention. In 1875, Wight was appointed chief geologist and surgeon general for the State of Wisconsin. 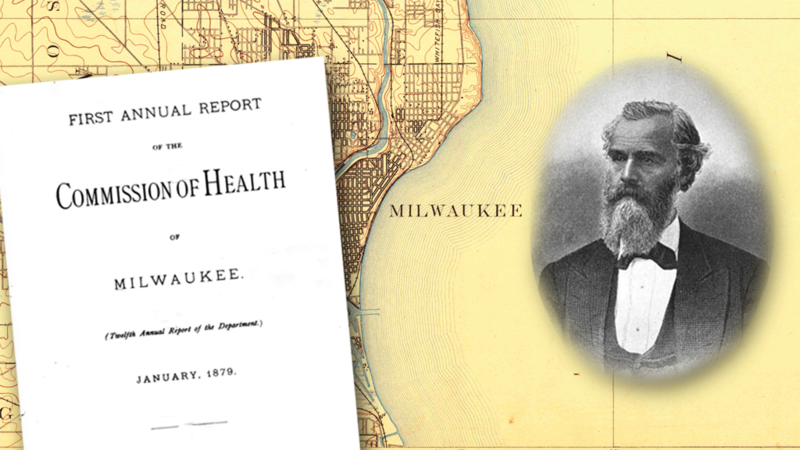 In 1878, he was named health commissioner for the City of Milwaukee. Sometimes, in a dry season, the sewage of Milwaukee nearly equals the quantity of water flowing in the rivers. At least 100 tons of human and animal excreta, to say nothing of other putrescible organic matters, are emptied into these sluggish streams every day. Their waters are dark with filth, and yet the question is asked whether they are unhealthy. If a thick solution of ordure is unhealthy, the Milwaukee and Menomonee rivers are certainly so. Changes large and small were desperately needed and Wight threw himself wholeheartedly into his work, recommending sweeping changes in how the city obtained drinking water and disposed of waste. It seems heartless to dwell upon the economic side of the great and important problem. Above all, and beyond all, are human suffering, constitutions broken for life, seeds of disease early sown, pain too deep for tears in the panting breast of many a little one, the heartache of parents, the shroud, the emblems of mourning, the solemn dust to dust and ashes to ashes closing blighted careers which sanitary wisdom might have prolonged over the customary years of usefulness. A few people grumbled about tyranny in a free country, and one clergyman sent me word that I was interfering with Divine Providence. I sent him back word that if he would produce an authenticated order from Divine Providence that smallpox, scarlet fever, and diphtheria shall not be contagious at funerals, then the Commissioner of Health would consider his order superseded. 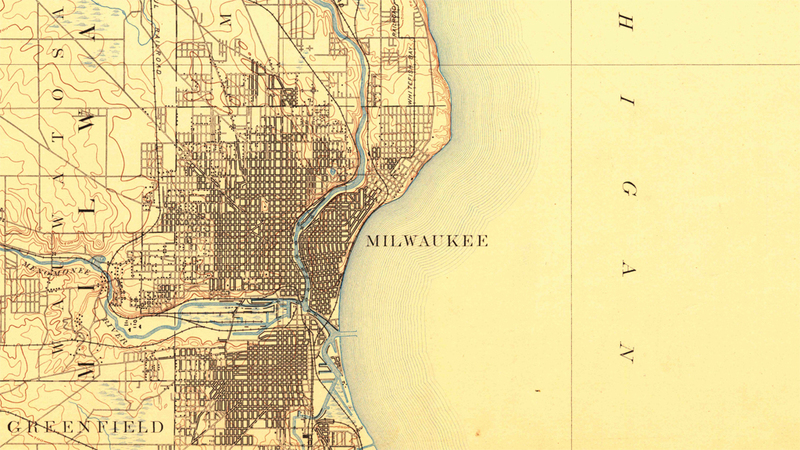 Milwaukee, as it appeared in O.W. Wight’s time. A merchant complains that the odor of a hog pen reaches his new mansion. A pauper brings a piece of tainted meat, supplied by the contractor for furnishing provisions to the poor, and asks for the protection of the proper officer. One is distressed with the sickening smell of a neighboring soap factory. Another brings wormy flour purchased at a grocery. Mrs. Pickle comes to scold about Mrs. Fidget who lets her hens run at large in the back yards of neighbors. Dr. Teufelsdrock demands that the Commissioner shall suppress a certain blacksmith who has the impudence to practice medicine. A gentleman has discovered a dead hen in the street and lectures the Department for permitting such things. A meek man seeks redress against a neighbor whose foul privy vault stains through a thick wall into the very room where he sleeps in the basement of his house. A widow sobs while she narrates that her landlord lets stagnant water stand two feet deep in the cellar of the house where she lives. A laborer brings a cup of milk, alive with bacteria, from the dairy of Herr Gotlos, who keeps his cows shut up in an unventilated stable and feeds them with nothing but “still-slops;” and wants to know if that is what makes his children sick. A Grand Avenue “nob,” whose nose is still turned up in memory of odoriferous vapors, demands that the Commissioner of Health shall instantly suppress several great packinghouses in which half a million of money is invested. And so on, to the end of a long chapter. Just as suddenly as Wight appeared on the scene he was gone. In 1881, he accepted appointment as health officer for the City of Detroit. While his work had been well received in Milwaukee, it was a different story in Detroit where officials were reluctant to give his office any real power and even medical men argued against his recommendations. Wight persevered for a time – he is credited with spearheading the reconstruction of Detroit’s sewer system – but finally decided it was impossible to continue in office. He resigned and set off on a voyage across the Pacific. During the journey, Wight contracted a tropical fever, which left him greatly weakened. Returning to Detroit, he wrote and published a book of his lifetime travels entitled, A Winding Journey around the World. Wight was 64 at the time of his death. There are no statues of Wight or parks named for him in Milwaukee. He is almost entirely forgotten. ← Did Uncle Sam steal part of Estabrook Park?